Landscape painting is traditionally at the top of the hierarchy of Chinese painting styles. It is very popular and is associated with refined scholarly taste. The Chinese term for “landscape” is made up of two characters meaning “mountains and water.” It is linked with the philosophy of Daoism, which emphasizes harmony with the natural world. Chinese artists do not usually paint real places but imaginary, idealized landscapes. The Chinese phrase woyou expresses this idea of “wandering while lying down.” In China, mountains are associated with religion because they reach up towards the heavens. People therefore believe that looking at paintings of mountains is good for the soul. Chinese painting in general is seen as an extension of calligraphy and uses the same brushstrokes. The colors are restrained and subtle and the paintings are usually created in ink on paper, with a small amount of watercolor. They are not framed or glazed but mounted on silk in different formats such as hanging scrolls, handscrolls, album leaves and fan paintings. In China, painters and calligraphers were traditionally scholars. The four basic pieces of equipment they used are called the Four Treasures of the Scholar’s Studio or wenfangsibao: paper, brush, ink and inkstone. A cake of ink is ground against the surface of the inkstone and water is gradually dropped from a water dropper, gathering in a well at one end of the stone. The brush is then dipped into the well and the depth of intensity of the ink depends on the wetness or dryness of the brush and the amount of water in the ink. Ink cakes were made from carbonized pinewood, oil and glue, moulded into cakes or sticks and dried. 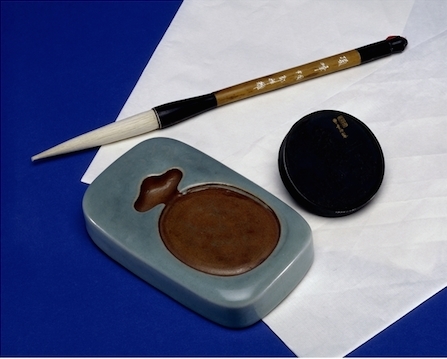 The most prized inkstones were made of Duan stone from Guangdong province, although the one shown here is made of ceramic. Brushes had very pliable hairs, usually made from deer, goat, wolf or hare. Wrist rests gave essential support while painting details. Other equipment used on a scholar’s desk includes brush washers, seals, seal paste boxes, brush pots and brush stands. In the seventeenth century print-painting manuals began to be designed to help train artists. These showed, step by step, how to paint in the style of particular artists. They illustrated a variety of subjects, from small rocks to mountains or tree branches to forests. The different brush strokes were named and explained. 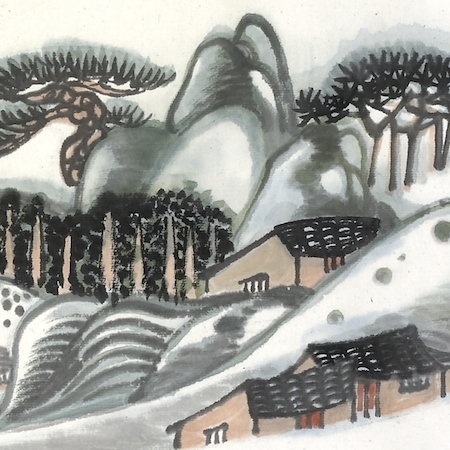 In China, the earliest landscapes were portrayed in three-dimensional form. 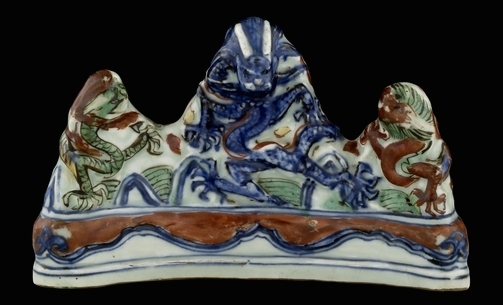 Examples include mountain-shaped incense burners made of bronze or ceramic, produced as early as the Han Dynasty (206 B.C.E. – 220 C.E.). The earliest paintings date from the sixth century. Before the tenth century, the main subject was usually the human figure. In the period following the Han dynasty, Buddhism spread across China. Artists began to illustrate stories of the life of the Buddha on earth and to create paradise paintings. In the background of some of these brightly colored Buddhist paintings, it is possible to see examples of early landscape painting. This scene is one of a series of three representing the life of the historical Buddha, Prince Sakyamuni, when he lived on earth. The mountains are simple triangles and their ridges are painted with short brush strokes to create texture. The water in the river is portrayed in a bold, diagrammatic way, conveying a sense of movement. Chinese paintings are usually created in ink on paper and then mounted on silk. This is done using different formats including hanging scrolls, handscrolls, album leaves and fan paintings. Cite this page as: The British Museum, "Chinese landscape painting," in Smarthistory, February 28, 2017, accessed April 21, 2019, https://smarthistory.org/chinese-landscape-painting/.